Every time you shop with us, we reward you with points to thank you for being our customer. The more you shop with us, the more points you receive from us. You can use your points to redeem our exclusive gifts at any time in your account or you can keep your points rolling so when you redeem, you redeem BIG! For detailed instructions on where to view your points, see the list of rewards and to find out how to redeem them, please click here. If you have shopped with us before, your account is already up and running so you don’t need to do anything else. Any points you have accrued and not redeemed in the last 12 months are stored in your account. To view your points and browse our rewards, simply log into your account using the email address you had used when placing your order. If you have not shopped with us before, opening an account is easy – click here and let us know your name and your email address. 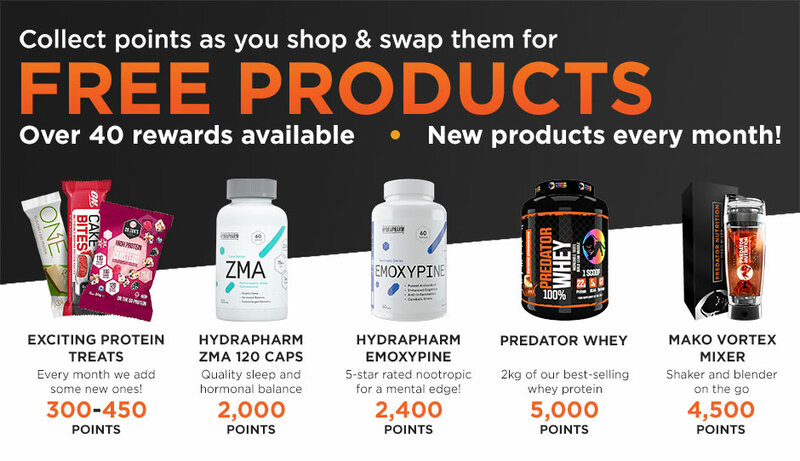 Sign up to our Newsletter to earn your first 500 points and you will already have enough points to redeem your first reward with your first order! When placing your order, remember to use the same email address you had used to register so we can credit the points from your shopping to the right account. The more you shop with us, the more points you receive. Points are added to your account automatically after each purchase and will be credited to the account you use to check out. How quickly you accrue your points depends on your status. You can check your status and the number of points you have available at any time in your account. For detailed instructions on where to view your points, see the list of rewards and to find out how to redeem them, please click here. Earn 500 points for signing up to our Newsletter and be the first to know about new product launches, special offers and discounts. You can sign up to our Newsletter by clicking here. Review a product you have purchased and enjoy 100 points. Each month, you can earn up to 1,000 points this way (based on 10 product reviews). Please note, every product review is subject to being checked before it can be published on our website. Points for leaving a review will be awarded as soon as your review has been approved, which may take up to 3 days. Share your positive experience of shopping with Predator Nutrition by leaving a Trustpilot review and we will award you 100 points. To leave a review, please click here. To claim your points, please email marketing@predatornutrition.com to let us know you've left a review and confirm the email address that's linked to your account. Please note, points for leaving a Trustpilot review may take up to 3 days to show in your account. Share your positive experience of shopping with Predator Nutrition by leaving a review on our Facebook page and we will award you 200 points. To leave a review, please click here. To claim your points, please email marketing@predatornutrition.com to let us know you've left a review and confirm the email address that's linked to your account. Please note, points for leaving the review may take up to 3 days to show in your account. Earn 100 points for following us on Twitter. To connect with us on Twitter, please click here. Earn 200 points for following us on Instagram. To connect with us on Instagram, please click here. You can view your points and the list of rewards available to you at any time in your account. For detailed instructions on how to log in, check your points, available rewards, and find out how to redeem them, please click here. If you love Predator Nutrition, tell your friends and get rewarded with a free tub of Daily Amino from Cobra Labs worth £19.99. Enter your friend's details here and we'll send them an email with a code for a free £15 giftpack with their first order. Once your friend has placed an order, you will be sent a code to use on your next purchase with us. Apply the code at the checkout and we'll add the freebies to your shopping.